Why is Sustainability Planning Rarely Addressed? Relevance of the topic: Is there a well-defined need and priority for the knowledge that is being implemented? Is there consensus about what knowledge needs to be sustained and what is needed to create conditions for sustainability? How does the new knowledge fit with current priorities? Benefits: What are the anticipated outcomes of knowledge implementation from a biological, economic, psychological, organizational, social, political, or other perspective? How meaningful are these benefits to the various stakeholders? Attitudes: What are the attitudes of the patient/client, their family, the public, health care providers, and relevant decision-makers toward the innovation? Leadership: What actions might leaders and managers at all levels of involvement take to support the sustainability of knowledge use? Are there champions for the change? Who is responsible for continued implementation of the innovation and making modifications as new knowledge is brought forward? Who will be responsible for ensuring that relevant outcomes are met? Policy articulation and integration: How will the fit between new knowledge and existing policies be assessed? How might the knowledge be integrated in relevant policies, procedures, regulatory and documentation systems? Financial: What funding is required to implement, sustain, and scale up knowledge? What flexibility in funding is necessary and available for reimbursement? Can cost-effective strategies be used? Political: Who are the stakeholders and what power or support might be leveraged? Who will initiate scaling up processes? Buchanan D.A., Fitzgerald L., Ketley, D. The Sustainability and Spread of Organizational Change. New York: Routledge; 2007: xxiii. Davies, B., Edwards, N., Ploeg J., Virani, T., Skelly J., Dobbins M. Determinants of the sustained use of research evidence in nursing: final report. Canadian Health Services Research Foundation & Canadian Institutes for Health Research. Ottawa, Ontario, Canada; 2006. 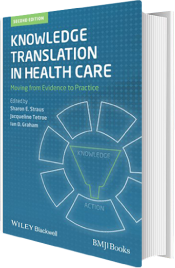 Greenhalgh T., Robert G., Bate P., MacFarlane F., Kryiakidou, O. Diffusion of Innovations in Health Service Organizations: A Systematic Literature Review. Boston: Blackwell Publishing; 2005. Gunderson L.H., Holling C.S., Panarchy: Understanding Transformations in Human and Natural Systems. Washington, DC: Island Press; 2002. Hanson K., Ranson M.K., Oliveira-Cruz V., Mills A. Expanding access to priority health interventions: a framework for understanding the constraints to scaling up. Journal of Epidemiol 2002; 12: 151-6. Maher L., Gustafson, D., Evans, A. Sustainability model and guide. NHS Institute for Innovation and Improvement; 2007. Mancini J.A., Marek L. Sustaining community-based programs for families: conceptualization and measurement. Family Relations 2004;53: 339-47. NHS Institute for Innovation and Improvement. Improvement Leader’s Guide to Sustainability and Its Relationship with Spread and Adoption. 2007. Pluye P., Potvin L., Denis JL., Pelletier J. Program sustainability: focus on organization routines. Health Promotion Int 2004; 19: 489-500. Rogers E.M., Diffusion of Innovations. 5th ed. New York: Free Press; 2005;429. Shediac-Rizkallah M.C., Bone L.R. Planning for the sustainability of community-based health programs: conceptual frameworks and future directions for research, practice and policy. Health Educ Res 1998;3 : 87-108. Sibthorpe B.M., Glasgow N.J., Wells R.W. Emergent themes in the sustainability of primary health care innovation. MJA 2005; 183[10 Suppl]: S77-S80, page S79. Simmons R, Fajans P, Ghiron L. (eds.). Scaling up health service delivery: from pilot innovations to policies and programmes. WHO World Health Report; 2006. Wakerman J., Chalmers E.M., Humphreys J.S., Clarence C.L., Bell, A.I., Larson, A. et al. Sustainable chronic disease management in remote Australia. MJA 2005; 183 : S64-S68.